Here are the answers to a few re-current questions. Question: How do I submit a result? Answer: That’s quite easy. Just click on the ‘submit’ button on the upper-right of this site. Select the application of which you have a screenshot, fill in all the details, add appropriate validation and you’re done! Question: How can I compete in the leagues? Answer: From the moment you submit a result, you enter the HWBOT Enthusiast League. If you want to change to the Xtreme Overclockers League, or perhaps even the Pro OC League, you can do so in your user profile options page. Note that the Hardware Masters is a bit different from the three other leagues; everyone is ranked in that league. Question: Do I need to add system pictures to my submissions to receive points? Answer: No. The picture requirement only applies to the calculation of your Enthusiast League ranking. All your submissions will receive points and contribute to the team, even if you do not have pictures attached. If you are competing in the Enthusiast League, however, you will need to add system pictures if you want the submissions to contribute to your personal total. Question: I lost points in comparison to Rev3, how is that possible? Answer: Of course the reason can be different for everyone, but the most common cause of the loss of points is the removal of the personal hardware point cap of 300 points and instead limiting the effect of hardware points to ‘top-20’ most rewarding scores. The only way to ‘solve this situation is by … pushing harder! Question: Can I still help my team even if I’m competing in the Pro OC League? Answer: Yes. Always. Even if you’re ranked, as an individual, in the Pro OC league your points will still contribute to the team total. The split in R4.0 is the basic outlining of how we vision pro and amateur overclocking to evolve into. For further revisions we have some ideas to differentiate in a more, ehm, elegant manner, but whether or not we can actually implement those ideas directly or if they need more finetuning is something we have to decide based on the feedback we get. Question: When do you qualify as Pro and have to switch to that league? Answer: Currently, there is no clear outlining on who’s considered pro and who isn’t. Or even who should go into that separate league and who shouldn’t. Currently, I’m moving those people who work almost exclusively with sponsored hardware and only for pure marketing-related overclocking to that league as that’s what it was designed for. This is for instance KP, Hicookie or Elmor. I think for the first couple of weeks we’ll see who wants to join and how the flow works exactly (many or little overclockers making the jump, etc …). Except for the group mentioned earlier, we don’t intend to force people in either league. When discussing the design for the first time, we also got the question what to do with review samples. That is quite simple: we have no interest in either tracking all review samples or vetoing against sending a specific person specific hardware. What we asked vendors is to honor the Pro OC league by focussing the marketing-overclocking events (eg: sending super-binned hardware) as much as possible in that league and leave the hobbyist rankings as they are. We also explicitly said that there’s no problem with sending anyone a mainboard or a vga card. In your particular situation, this all boils down to: we do not have the slightest problem with you getting any samples or you choosing for the normal oc’er ranking. If you feel Pro and want to join, okay. If you feel Pro is a bit out of your reach at the moment, feel free to compete at the top of the non-pro ranking. Answer:First of all, it’s important to understand the difference between a user ranking and a powerteam ranking. The user ranking is an hardware or global list of benchmark submissions filtered to show only the best score per user. Every single ranking of the current Rev3 is a user ranking. If you go to our test server and look for any random ranking, you can see a little filter that says: “best of: member | team”. If you click on ‘member’, it will show you the user rankings. If you click on ‘team’ it will show you the ‘powerteam ranking’. 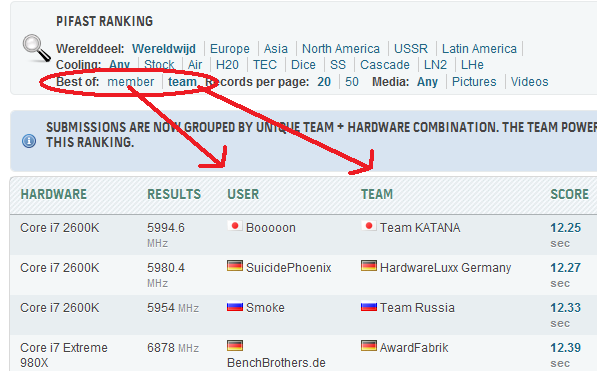 For each global and hardware ranking you currently find in rev3, there is a user and powerteam version in rev4. The points for a specific place in a user or powerteam ranking will be shown next to the submission. Currently this is not the case as the rankings need to be polished a bit. In any case, the way the powerteam points are calculated are very similar to the way the user points are calculated (both in rev3 and rev4): based on position within a ranking and the ‘weight’ or competitiveness of the ranking. In other words, the more teams are competing in a specific ranking, the more powerteam points you will get in the ranking. Note that just like the user ranking, the powerteam rankings are also split up based on amount of cores. In the current algoritm, the practical weight between user and powerpoints is +/_ fifty-fifty. By this I mean that you need a vast amount of user points in addition to the powerteam points to have a solid ranking. As for sharing. Note that the current hardware sharing rules are still applicable! So sharing a CPU for CPU benchmarks is not allowed, sharing a GPU for GPU benchmarks is not allowed, etc. The benefit of illegal hardware sharing has decreased by a factor of 10. 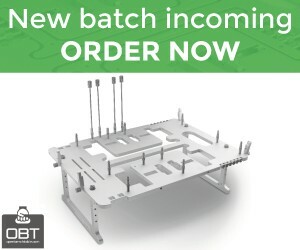 Question: How is Rev4 better for AMD lovers? In theory you can get as much as 1000 points from 20 #1 hardware submissions.